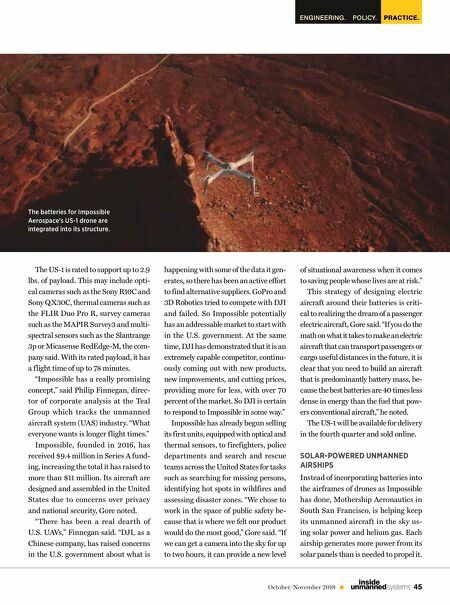 AIR POWER SOURCES 44 October/November 2018 unmanned systems inside T hough drones are poised to revolutionize numerous industries, their usefulness is often capped by short- lived batteries that limit them to relatively brief mis- sions. Two companies are addressing this challenge with pro- foundly different unmanned aircraft. One has developed an electric drone that can fly roughly four times longer than other battery-powered drones, while the other has invented a solar- powered airship that might one day serve as a drone carrier. A FLYING BATTERY A new electric drone, the US-1, can f ly for two hours on a single charge—a f light time comparable with gasoline-fueled systems. In contrast, a typical battery- powered quadcopter can f ly up to about 30 minutes on one charge. With the launch of its US-1 drone the firm Impossible Aerospace of Sunnyvale, California vaulted out of stealth mode. The unmanned aircraft is the result of years of development from motor and battery experts formerly from, among others, Tesla Motors and SpaceX. "We are very excited to unveil the US-1 to the public as our first product," said Spencer Gore, founder and CEO of Impossible. The new drone is a quadcopter that is about 26 inches long and 26 inches wide, with an unladen mass of 15.7 lbs. It can f ly at speeds of more than 42 miles per hour, reaching more than 46.6 miles before recharging. The US-1 relies on lithium-ion batteries that can charge up to 80 percent in 40 minutes. The secret of the US-1's endur- ance is the batteries form part of the US-1's airframe. "A lot of drone companies look at their vehicles and say, 'The big- gest, bulkiest part is the battery, so how can we carry less of that,'" Gore said. "We looked the other way—no matter what, the battery is going to be heavy, so we just really thought about how we could make this bulk as useful as possible." "Not much (of what) you are looking at is not battery with the US-1," Gore said. Gore began researching electric aircraft due to his experience working on electric cars at Tesla Motors. "A big problem the drone industry faces is that it promised that the future of drones was to fly beyond the line of sight, but the battery life of these systems is so poor that this is not really pos- sible," Gore said. "So we aimed to rethink what the drone should be from the ground up, just like Tesla did with the electric car. For instance, Tesla did not just take a gas-powered car and swap in batteries; they did things like put motors in the wheel wells where they be- longed, unlike what you see with conventional cars. We are es- sentially doing the same thing with drones." Photo courtesy of Impossible Aerospace. Firms are now working on a drone that can fl y two hours on a single charge, and a solar-powered airship that could someday carry drones. 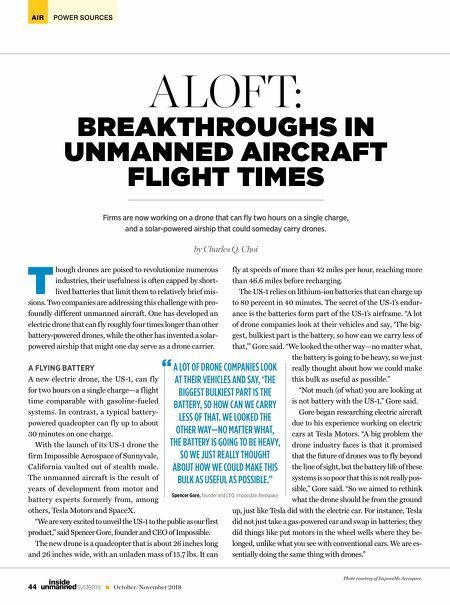 by Charles Q. Choi BREAKTHROUGHS IN UNMANNED AIRCRAFT FLIGHT TIMES ALOFT: A LOT OF DRONE COMPANIES LOOK AT THEIR VEHICLES AND SAY, 'THE BIGGEST BULKIEST PART IS THE BATTERY, SO HOW CAN WE CARRY LESS OF THAT. WE LOOKED THE OTHER WAY—NO MATTER WHAT, THE BATTERY IS GOING TO BE HEAVY, SO WE JUST REALLY THOUGHT ABOUT HOW WE COULD MAKE THIS BULK AS USEFUL AS POSSIBLE." Spencer Gore, founder and CEO, Impossible Aerospace "